Head to Museu Calouste Gulbenkian and Rossio Squarefor plenty of shopping. You'll get in some beach time at Praia da Nazare and Praia Grande. Explore Lisbon's surroundings by going to Obidos Village (in Obidos), Monastery of Alcobaca (in Alcobaca) and Sintra (Quinta da Regaleira, Sintra National Palace, & more). Spend the 28th (Sun) wandering through the wild on a nature and wildlife tour. There's still lots to do: contemplate in the serene atmosphere at Jeronimos Monastery, enjoy the sand and surf at Praia do Carvalhal, explore the historical opulence of Castelo de S. Jorge, and wander the streets of Belém Tower. To see more things to do, ratings, other places to visit, and other tourist information, you can read our Lisbon visit website . Phoenix, USA to Lisbon is an approximately 17.5-hour flight. You can also do a combination of bus and flight. Traveling from Phoenix to Lisbon, you'll lose 7 hours due to the time zone difference. Prepare for cooler weather when traveling from Phoenix in July: high temperatures in Lisbon hover around 85°F and lows are around 63°F. Finish up your sightseeing early on the 10th (Sat) so you can travel to Barcelona. Museum-lovers will appreciate Casa Batllo and Museo Picasso. 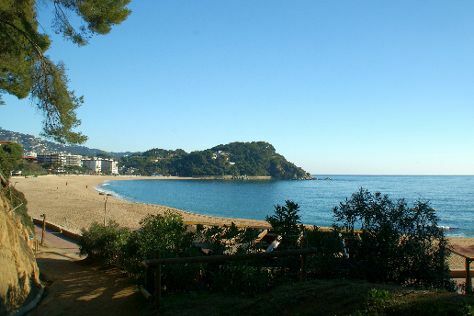 Take a break from the city and head to Fenals Beach and Playa Sa Riera. Explore Barcelona's surroundings by going to Santa Cristina Hermitage (in Lloret de Mar), Girona (Jewish Quarter, Girona Cathedral (Catedral), & more) and Parroquia de Sant Cugat (in Salt). Spend the 15th (Thu) among aquatic life with a scuba or snorkeling tour. The adventure continues: take in the architecture and atmosphere at Basilica of the Sagrada Familia, ponder the design of Illuminated Fountain, explore the ancient world of Anfiteatro de Tarragona, and see the interesting displays at Carrer del Mirador del Palau Nacional. For more things to do, reviews, ratings, and more tourist information, go to the Barcelona route maker tool . You can fly from Lisbon to Barcelona in 5 hours. Alternatively, you can drive; or do a combination of bus and train. You'll lose 1 hour traveling from Lisbon to Barcelona due to the time zone difference. Traveling from Lisbon in August, plan for a bit warmer nights in Barcelona, with lows around 71°F. Wrap up your sightseeing by early afternoon on the 26th (Mon) to allow enough time to travel back home.